A huge Happy Birthday to Baker Ross who are celebrating their 40th Birthday today! Maxx and I have been sent some surprise craft boxes over the last couple of months and what better day to post our thoughts on our latest box than on their 40th Birthday! If you’re not familiar with Baker Ross they are a family run business that was co-founded in 1974 by Patti Baker. 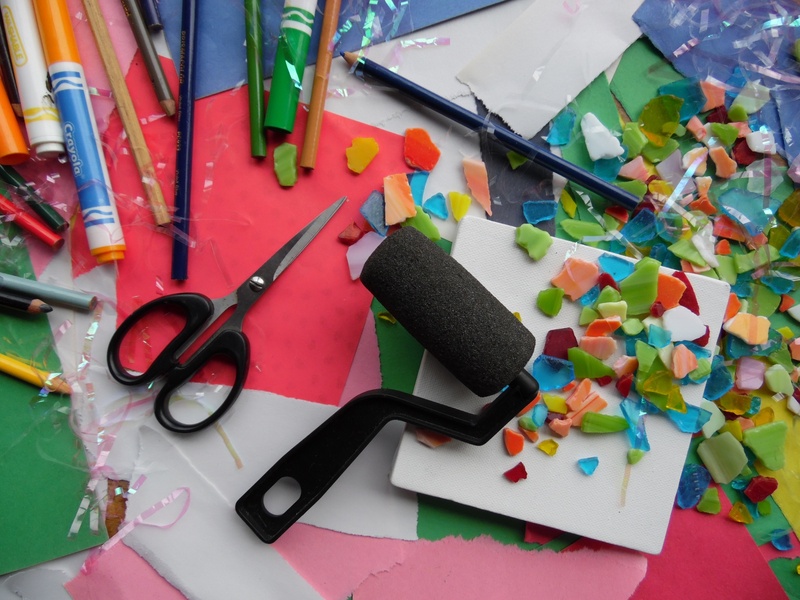 Baker Ross is one of the top suppliers of arts & crafts supplies to schools, playgroups and organisations in the UK. 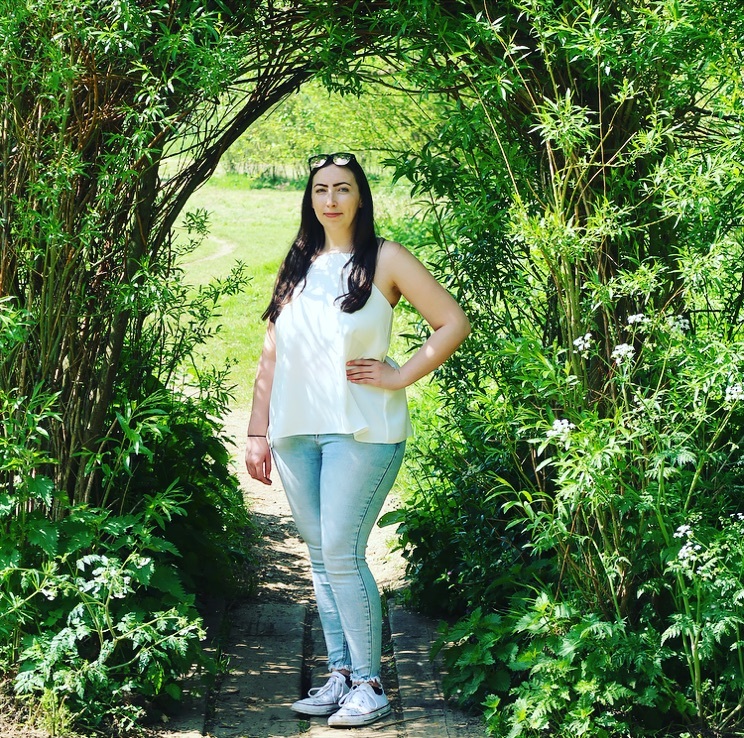 The website boasts over 4,000 items with a huge range of fun craft ideas for a wide age range, there’s something for everyone and at a reasonable price too. Maxx loves it when a package arrives from Baker Ross, he loves opening it to see what’s inside and is always eager to get started straight away – he has always loved being crafty and making a mess! Inside our latest Baker Ross box were several fun beach themed craft supplies, plenty to keep Maxx and I busy during rainy days, which are sadly becoming more frequent now. 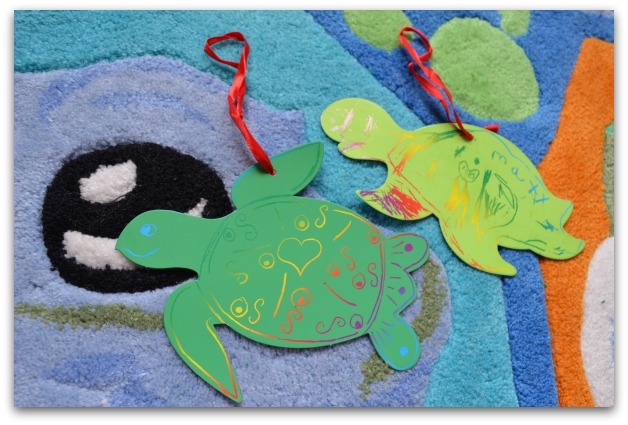 The first item that caught Maxx’s eye were the Turtle Scratch Art Decorations which are exclusive to Baker Ross. The kit includes 10 turtles which come in 4 different designs, ribbon for hanging and tools for etching the design. The great thing about this product is that it’s suitable for a wide age range so anyone can get involved and enjoy making a colourful masterpiece. I really like the idea behind this item, the designs are cute and the rainbow patterns and designs you can scratch on to them look pretty impressive. Simply use the tool provided to remove the specially coated surface and reveal a beautiful rainbow colour underneath, you can really let your imagination go to town with these and once the design is completed thread the ribbon through the pre-made hole and hang it up for everyone to admire. 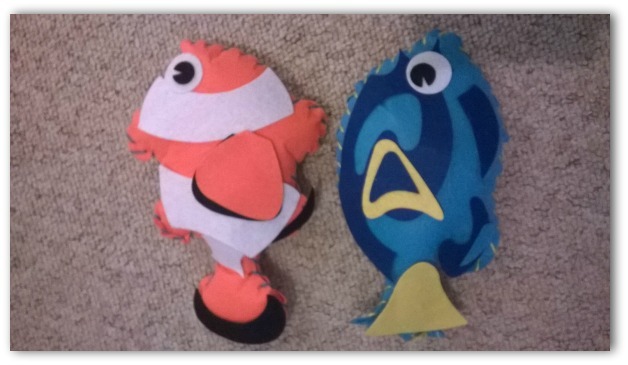 The next item we made were the Tropical Fish Cushions, Maxx loved these because one of the fish looks like Nemo from the popular children’s movie.. These are really easy and fun to make, the kit includes everything you need to make two fish cushions. I liked the fact that Maxx was able to make the fish with very little adult help which gave him a huge sense of achievement. It took around 10 minutes to make each fish which I think is a good length of time to keep children’s attention and keep them engaged. Maxx really enjoyed making the fish and the finished result was good. 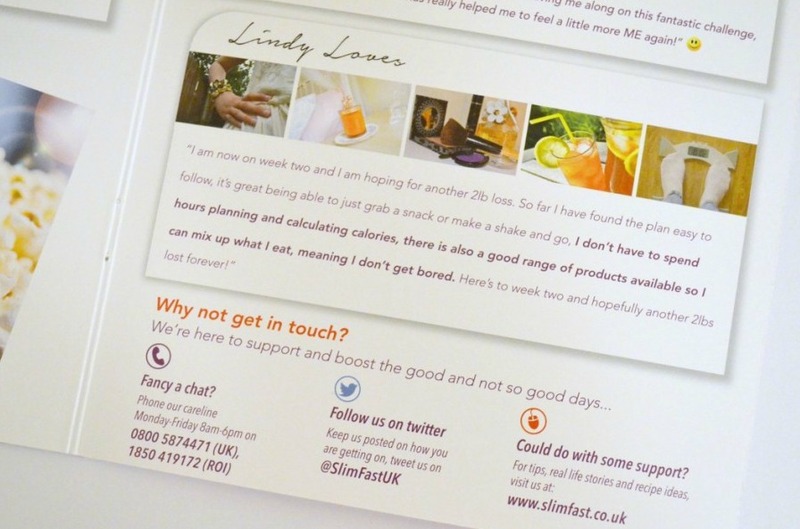 The only issue we had, which was a small one was the fact that some of the sticky-back felt decorations kept curling up but this wasn’t a big problem as we glues down the edges. 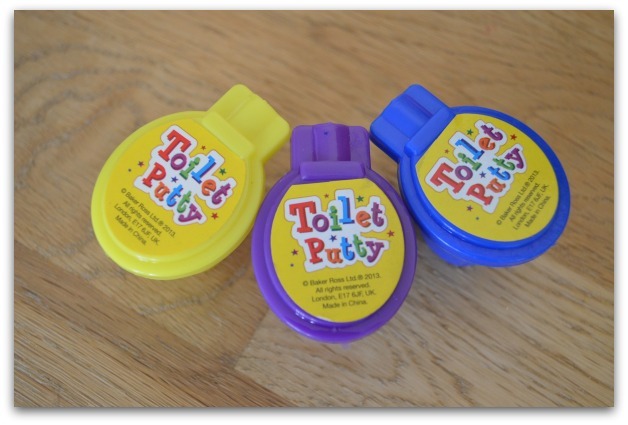 The toilet putty was of course a firm favourite with Maxx, he loved playing with it and even took two to give to his friends when he went on a play date. As most 5 year olds do Maxx thinks the noises the toilet putty makes are hilarious and it’s something that has made several appearances since they arrived. There’s an assortment of colours in the pack and at only 60p each these are perfect for children’s party bags. 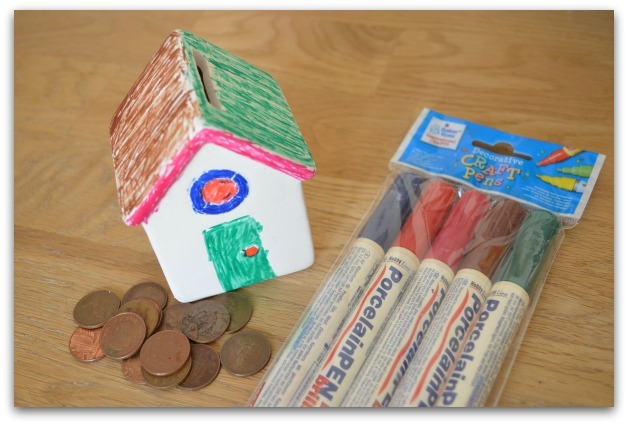 I really liked the Beach Hut Ceramic Coin Banks and as Maxx likes saving his money I knew they would be a huge hit with him. He loves nothing more than saving his money and puts any money he gets into his wallet to save it up. I think it’s a great idea to teach children good money habits from a young age and help them enjoy saving for something they really want. There are 4 Beach Huts in a pack so if you have more than one child there’s enough for everyone. They are well make, look great and are quite resilient. Maxx and his mummy decorated the beach huts using the porcelain pens that were also sent in the box, they looked great when they were finished and Maxx’s coin bank takes pride of place in his room. I was really impressed with the porcelain pens, they worked really well and were much easier to use than paint as Maxx had more control over the pen than he would a paint brush. We have used the pens on more than one occasion and they haven’t dried out at all which is great as we can use them time and time again. Definitely a good alternative to paint and a great buy if you don’t like mess. Maxx usually gets stickers in his magazines and enjoys giving everyone a sticker that he thinks they will like, he also likes making stories using stickers. 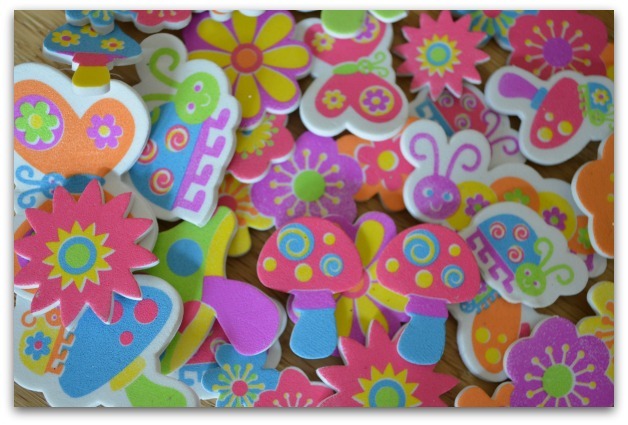 On this occasion he used the Groovy Garden Foam Stickers to decorate a birthday card he made for his mum, he really liked the colours in the packet and the cute designs, especially the mushroom and ladybird stickers which he said were lovely. There are 100 stickers in the pack so we won’t run out any time soon which is great as stickers are handy to have in a craft box as you can do a lot with them but it doesn’t create much (if any) mess when using them. 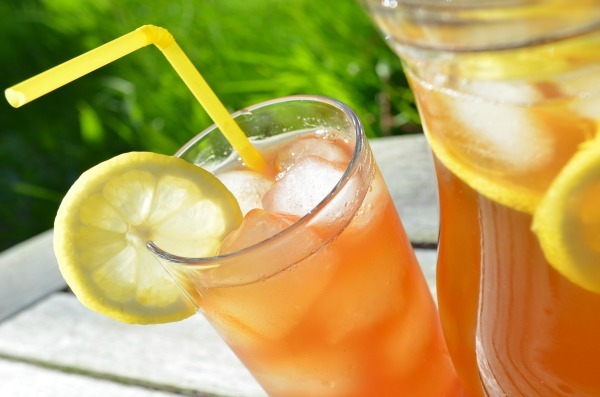 Having a selection of craft items for rainy day activities is a great idea, it lets you have something ready to enjoy should the weather take a turn for the worse. 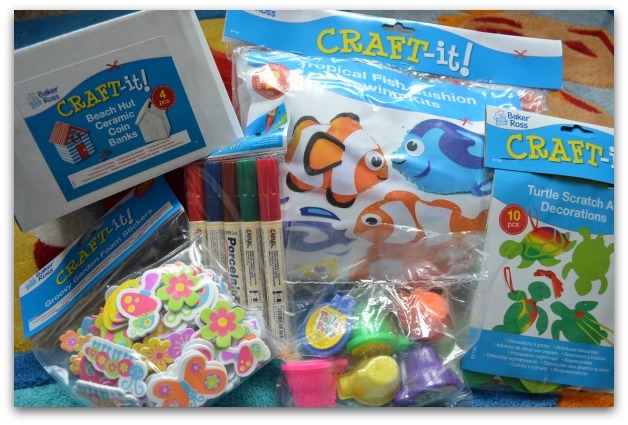 You could add stickers, clay for sculpting, paints, paper, sequins and so much more for creating mini masterpieces. You could even try your hand at making an item of clothing, how about a bag, cushion or t-shirt? If you want to give sewing a try then why not pick up a few items by Wunderlabel.co.uk. You can buy fabric labels, tags & stickers and ribbon to help you create and label any items you make. 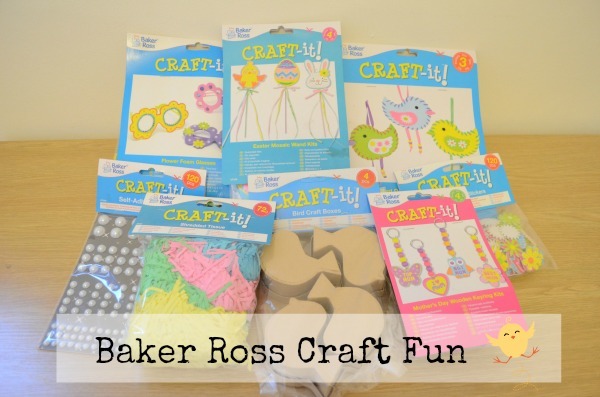 A big thank you to Baker Ross for sending us the box of craft supplies. As always Maxx and I really enjoyed using the craft items, it kept him entertained over a couple of afternoons when the weather wasn’t great. We have already received our next craft box which Maxx and I are both excited about getting stuck into as it’s a Christmas themed box – exciting! If you would like to buy any of the products featured in this post or to browse the full range of items available from Baker Ross head over to the Baker Ross website. oh wow, I’d love the porcelain pens but I know my little ones would love absolutely everything as they’re very much into making a huge mess, or being creative as I guess I should word it! Very jealous you got to play with all this!! My nephew is the same he loves anything that makes a mess and I have an excuse to join in ha ha!